To order one of the products on our website, you need to provide an Authorization Form from the licensed doctor. It will be considered valid only if it is sent by e-mail or fax from the doctor’s office. For your convenience, we can send you the necessary form by e-mail or fax. To do this, use the feedback form at the end of the text. In the field “Your message” write the names of the patient and the physician, as well as your doctor’s email address or fax number where we can send the form. You can place your order first, and then get a doctor’s permission. In this case, your reservation is still valid for 30 days. We are not able to ship the order without receiving a completed Authorization Form from the e-mail of a licensed physician or faxed from the doctor’s office. 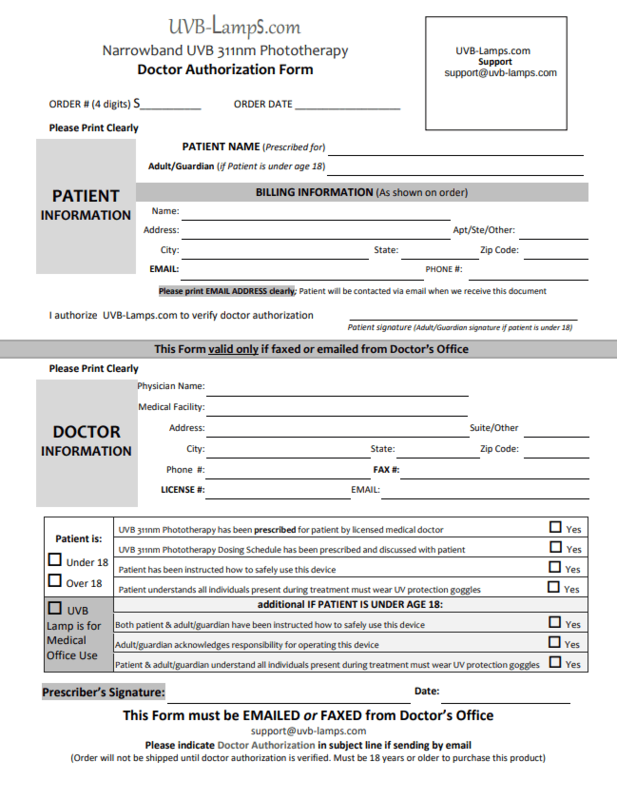 Remember to fill out and sign the section “Information about the doctor” processing the order, if you buy UVB-lamps for medical practice. Check the UVB Lamp for Medical Office Use, signature, and date on the Authorization form.